Is is just me or did the month of June completely speed by us?!?! 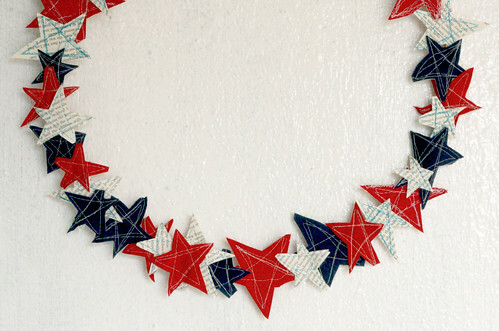 Well, whether I like it or not the month of July is starting and Independence Day is this weekend- YIKES! 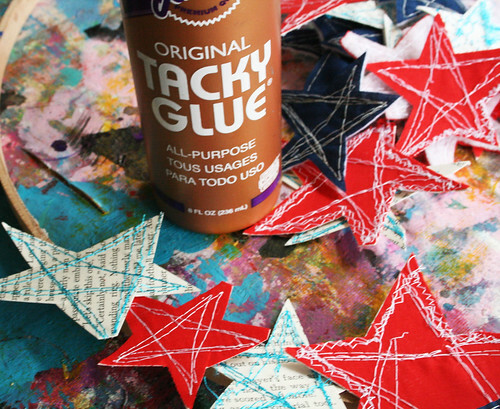 So I am dedicating the rest of the week to fun, easy and creative last minute ideas for your holiday celebrations! I wanted a creative and fun wreath for the door to welcome company and so far I've had no time to run to the store so I made use of what I had on hand. 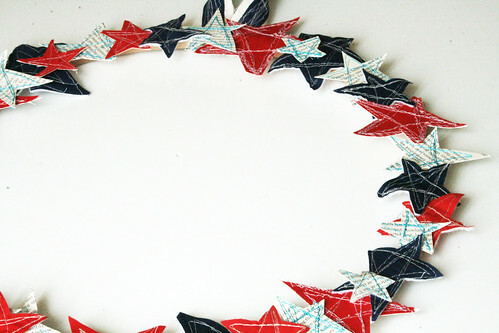 I started with the inside of an old embroidery hoop to use as the frame for my wreath. 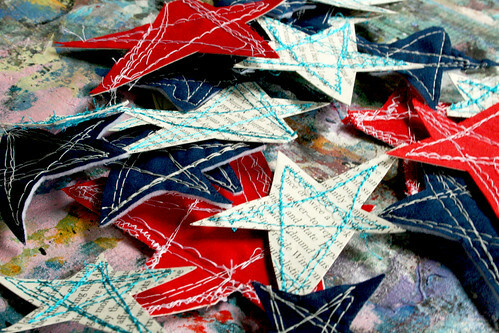 I created all kinds of stars from old bits and pieces of fabric and paper that I free motion stitched with different colors of thread. 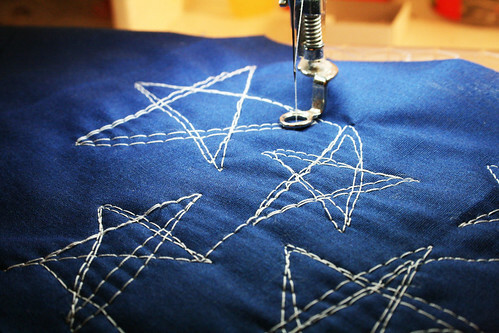 A variation for those who don't sew could be drawn, painted or even stamped stars. 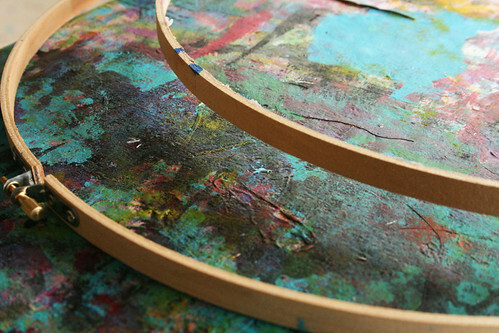 and with craft glue, I glued them to the surface of the hoop. 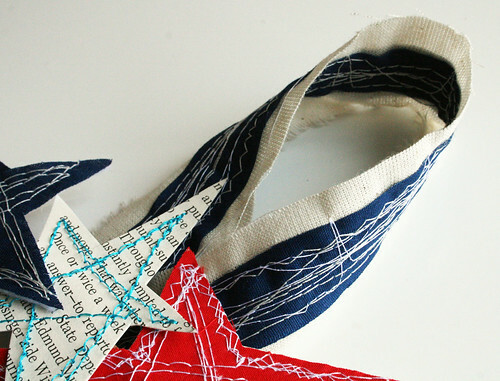 The last step was to create a little striped loop to add the back of the wreath for a hanger. And voilà!!!! 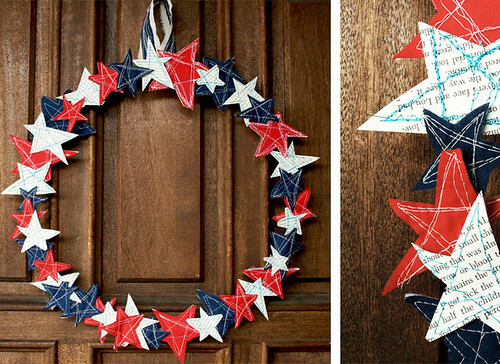 A simple, creative and patriotic wreath to add a little charm to the front door (with no money spent). fyi, we recently updated our blog with a 'stuff we like' tab, and added you! Brilliant I am going to try it! What a neat idea! 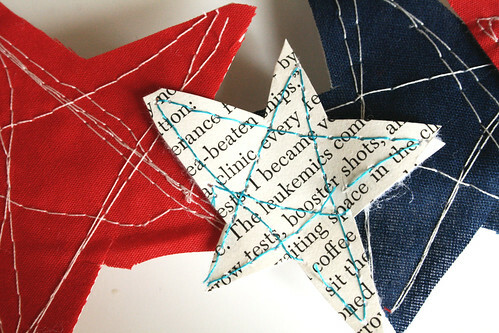 Love the use of the book pages mixed in with the fabric stars. 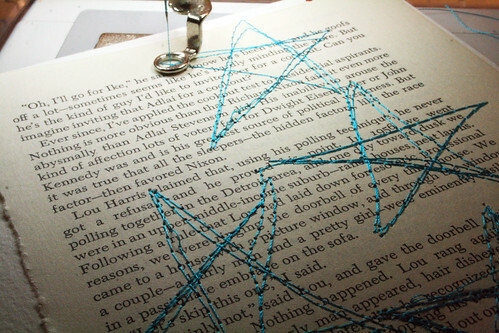 Wouldn't have thought to sew the paper like that. Very clever! Beautiful! 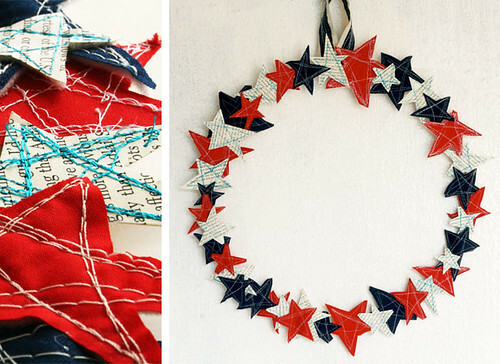 I love red, white & blue and think this is so creative! Love all the different texture. I might have to try one! Thanks for the inspiration!! Going to try to redo my faded Red White and Blue Wreath stored from last year .... may use your idea as part of the decorations. Here's a link to something I think is right up your alley. I would love to see your spin on these. Hi Alisa - love this! 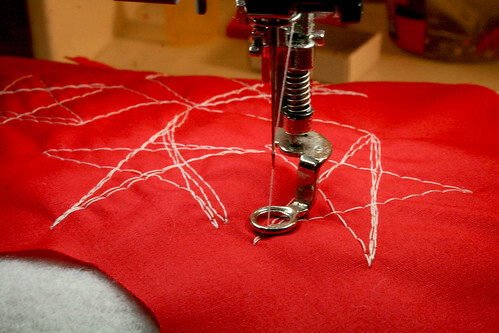 What's the name of the sewing machine foot you used? Is it an embroidery foot? Really cool idea! It looks like you've backed the fabric up with felt or something? You are an inspiration to so many of us - keep up the great work!